Comet is in the news as the European Space Agency's spacecraft made a first ever soft landing on a comet after a 10-year, 310-million-mile or 500-million-kilometer journey. However, the mission may have ended early as the spacecraft apparently bounced and landed in a shadow and could not get enough charge to its batteries from solar panels. A comet is basically a big dirty snow ball that circles the Sun. When getting close to the Sun, it gets heated up and begins to emit gas and particles from its nucleus, forming a visible atmosphere, and sometimes a tail upon the effects of solar radiation and solar wind. 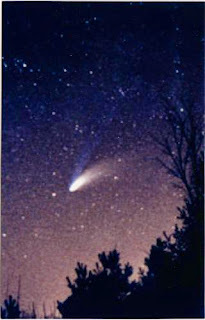 Comets become extinct when they have lost all of their volatile ices and particles as a result of having passed too close to the Sun, or having passed close to the Sun too many times. So, I am wondering if a comet has a choice, will she choose to stay away from the Sun and live as a dirty snow ball eternally, or to get close to the Sun and reveal herself in splendid once and for all? Postcard US-2107408 to Russia was made from a photo I collected when I was in graduate school. Google Image Search turns up several additional photos at Sunet.SE's ftp site. It looks like to be Comet Hale–Bopp that had its closest approach to Earth on March 22, 1997.